Nash is quietly enjoying a a superb season for the Phoenix Suns. He is currently second in the league in assists, averaging 11.3 per game, and leads the Suns in scoring with 16.8 ppg. Not bad for an over the hill point guard playing with a roster full of castoffs and has-beens (see Carter, Vince). The fact that the Suns are competing for a spot in the Western Conference playoffs is a testament to the Canadian savvy of Nash. I would love Phoenix to trade Nash to a contender, like the Mavs or Heat, giving him just one more shot at an NBA title. 9. 127 Hours/LaMarcus Aldridge (F, Portland Trail Blazers): James Franco was a guest on NPR’s Fresh Air podcast this past week and, true to form, he is a very interesting young talent. (Reason #44 that I am turning into my parents: public radio has become my preferred selection for both the morning and evening commutes.) The guy is also one of the busiest people in Hollywood. Franco is currently balancing grad school, directing, acting, and prepping to co-host the Oscars. Quite an accomplishment for your run of the mill stoner. As far as we know, LaMarcus Aldridge does not share James Franco’s affinity for marijuana but, much like 127 Hours, the 2011 Blazers are a one man show. Aldridge has turned into one of the best power forwards in the Western Conference. He has yet to receive the same national notoriety as Blake Griffin or Kevin Love, but Aldridge certainly deserves the lion’s share of praise for keeping Portland in the mix to host a first round playoff series. 8. Black Swan/Kobe Bryant (G, Los Angeles Lakers): This union was a no-brainer, especially after Kobe asked the enigmatic Pau Gasol to be give the Lakers more Mila Kunis and less Natalie Portman. Los Angeles is a really tough team to figure out, kinda like Portman’s character in the Black Swan. Some nights they glide around the court like the lead ballerina in a major production of Swan Lake, while other times their play resembles someone under the influence of heavy narcotics. Kobe continues to be the backbone of the entire Laker organization. His effort/performance during the recent NBA All Star game showcased his unrelenting determination and desire to compete. It’s too bad his Nike “Black Mamba” movie hasn’t received more play. Who knew Kanye could act? 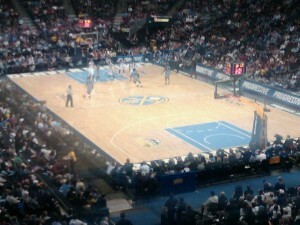 The New Orleans Hornets are enjoying somewhat of a dream season, thanks in part to the valiant efforts of Chris Paul. Rumor has it that Paul has been playing on a bum knee all year, which makes his, and the teams, accomplishments all the more impressive. New York Knicks fans should hope for Paul in 2012 to go along with Carmelo and A’mare. 6: The Kids Are All Right/Dwight Howard (C, Orlando Magic): I have to say that in an attempt to be authentic, The Kids Are All Right ended up a downright predictable Hollywood movie. It’s not that I didn’t enjoy the film, but just that I saw each and every dramatic twist and turn coming a mile away. Same can be said about the Orlando Magic and Dwight Howard. GM Otis Smith can retool the roster all he wants but the Magic still won’t be able to stand toe-to-toe against the Celtics, Heat, or maybe even Bulls. D12 continues to dominate the glass and block around 2 shots per game. The surrounding cast in Orlando will probably cost the Magic a second round playoff exit and then must sit and wait for Howard to demand a trade to the Lakers. These were the immortal words of viewmyseats own Dave after attending today’s Knicks matinee in Madison Square Garden. With Sunday’s 129-125 win over Denver, New York extends their win streak to 8 games and raises their season record to a formidable 16-9. This is a crucial week for the Knicks as the Celtics come to town Wednesday, followed by Lebron and the Heat on Friday night. Dave and his brother are lucky enough to have tickets to Friday nights contest against Miami. I was hoping to stumble upon a ticket myself but as Mike Francesa continues to remind me, there is “huuuge, repeat huuuge” demand for seats. Fear not, VMS will still be well represented. 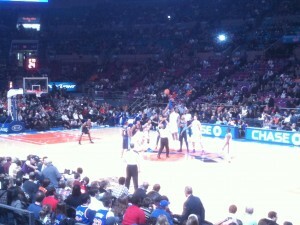 Anyone else fortunate enough to have tickets to the Knicks/Heat Friday night? Share your views.